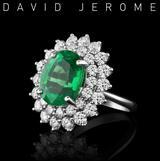 Comment: For those who have read other comments on Chrome Diopside, I ask for patience, when we again point out that 'chrome' is the decisive ingrediency for good diopside. The images show the intense shining, yet deep vivid, hue which only a high chrome content produces in this gem. 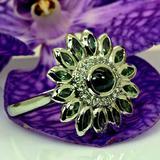 Many emeralds and other green gems may pale under this green sun. 6mm trillion, well cut, no window, no inclusions, no treatments (3xNo). An excellent ringstone, eye-catching, affordable, durable and as far from mundane as you can get. The trillion shape with 'normal' facets shows the deep neon color even better than the checkerboards we presented from this new Tanzanian source thus far. IGI report, with 'chrome' attested for future value retention, shipping and all other WildFish extras included in our prices. We have not yet seen such gems over one carat but we keep on searching.